Liberty Slots Casino has unveiled a brand new video slot game titled Amanda Panda and the Jackpot Journey! This should be exciting news for all online slot players because Liberty Slots assortment of slot games is expanding. The 5 reels and 25 paylines are wrapped in a jungle type animal theme that have sparkling Pots of Jewels, glistening Tropical Birds, Amanda Panda and other symbols ready to burst right off the screen. The colors are intense, the audio is fun and the atmosphere will have you believe you are swinging from tree to tree with Amanda Panda and her friends! There is a Wild symbol that will substitute for all symbols except the scatter which is the Amanda Panda Logo. Amanda Panda has two bonus rounds and they are Free Spins feature and a Secret Chamber feature. The Free Spins bonus will launch when three or more Scatters appear anywhere in the reels. A second screen will transition to the free spins feature. 8 selectable objects will be presented to the player and each will reveal a multiplier. Choose an object and once a pair that match is selected, the free spins will commence. 10 free games are awarded and they can be re-triggered with 10 more given. At the end of any spin The Secret Chamber feature will trigger randomly. A second screen will appear where players are presented with 15 selections. Each selection is either a coin value, a high prize icon or a stop icon. A coin selection will add coins to the bonus meter. A high prize icon will add one to the high prize meter and 3 high prize selections will add the high prize to the bonus meter. Each stop icon will add one to the stop meter. 3 stop selections will end the feature and the player will only win one half of the current bonus meter. Players can choose to end The Secret Chamber bonus round at any point by selecting the “collect” option. This allows the player to collect all that is in the bonus meter. 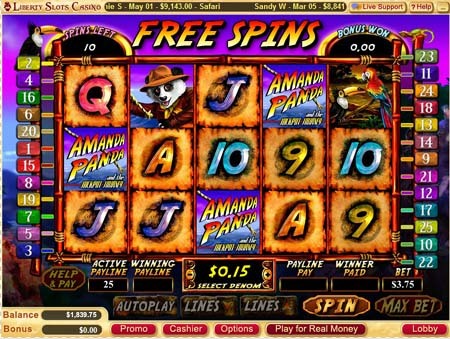 Amanda Panda is a great new online slot game which has the potential of some awesome jackpots. So come play with Amanda Panda as she searches for your jackpots at Miami Club or Liberty Slots! Liberty Slots operates on the Wager Gaming Technology platform which some still refer to as Vegas Technology its former name. No matter which you call it, you wil still over 100 online slots available for play.